The aim of this study was to test the transferability of workload measurements between three different types of bicycle ergometer. Two common ergometers (Lode Excalibur and Avantronic Cyclus 2) were compared with a powermeter (Schoberer SRM system) that enables the measurement of power output during road cycling. Twelve well-trained subjects participated in this study. 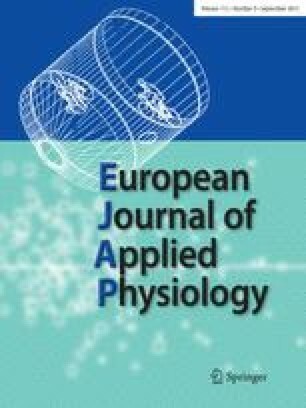 Within 12 h, each subject carried out three separate graded incremental exercise tests on each of the ergometric devices, and their oxygen uptake (V˙O2) and heart rate were determined. The three test protocols were identical: after warm-up, four stages of 4 min each at exercise intensities of 100, 150, 200, and 250 W. Pedalling frequency was controlled and there was no difference between the three ergometers. Tests were administered in a random order. Neither V˙O2 nor heart rate was affected by the type of ergometer used. For a given intensity, the same values were found in the two laboratory tests and in the field test (V˙O2: P=0.425; heart rate: P=0.845). Thus, the transferability of workload measurements between two different laboratory cycling ergometers and an ambulatory device was proven. Equivalency was determined using V˙O2 and heart rate as indices of metabolic and cardiovascular strain, respectively.